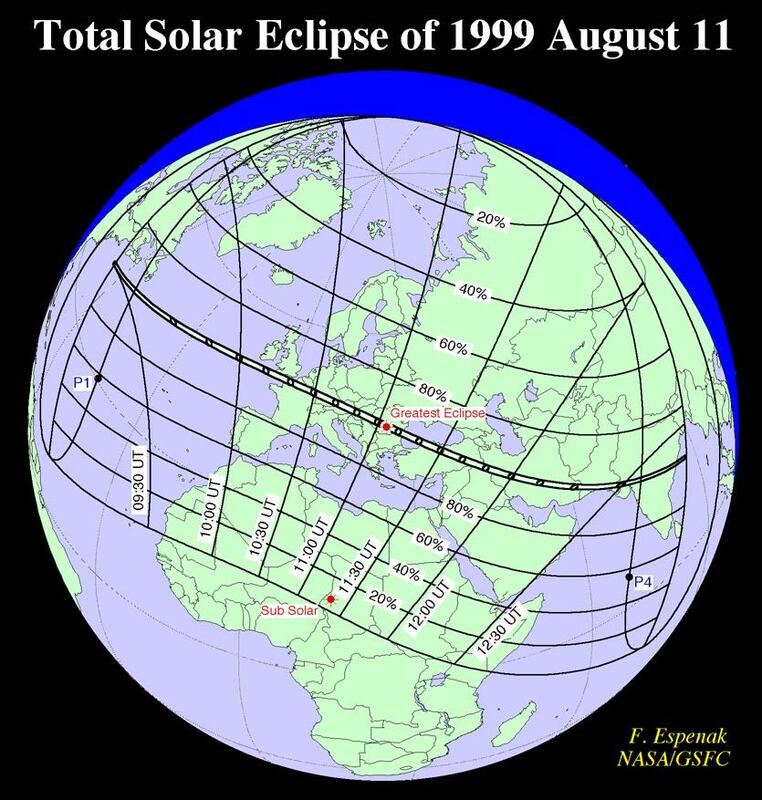 On Wednesday, 1999 August 11, a total eclipse of the Sun will be visible from within a narrow corridor which traverses the Eastern Hemisphere. 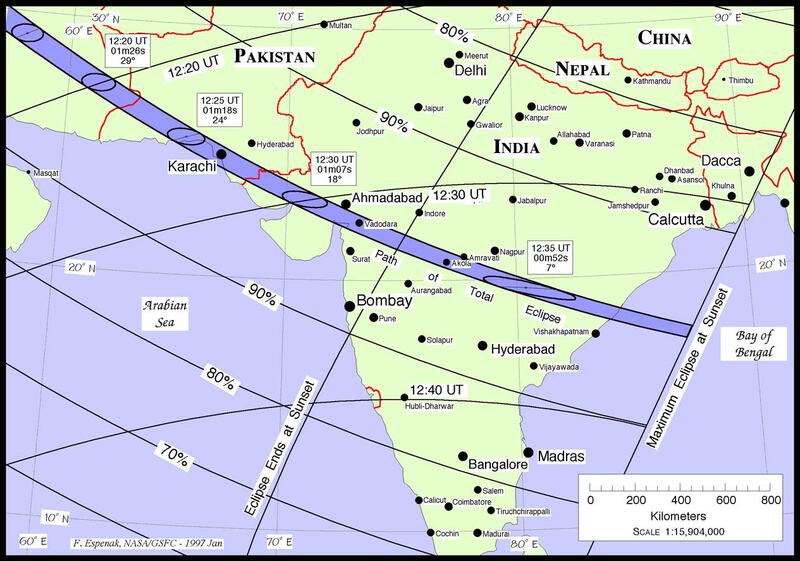 The path of the Moon's umbral shadow begins in the Atlantic and crosses central Europe, the Middle East, and India where it ends at sunset in the Bay of Bengal. 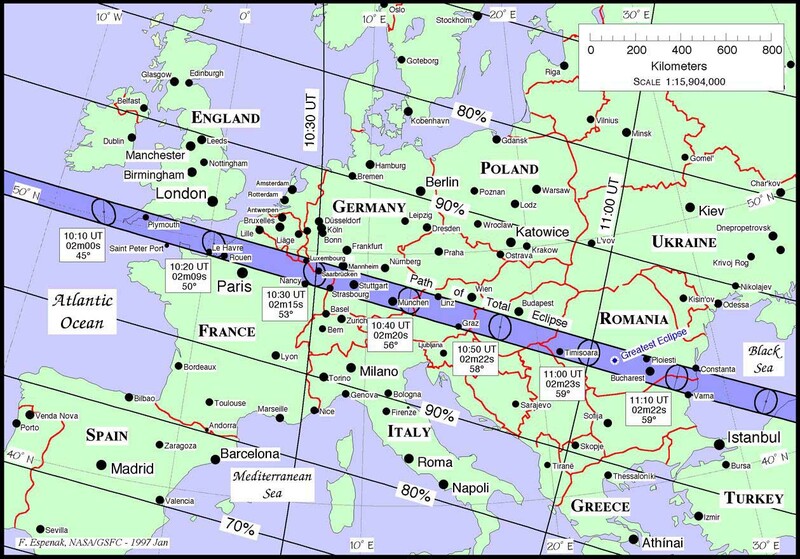 A partial eclipse will be seen within the much broader path of the Moon's penumbral shadow, which includes northeastern North America, all of Europe, northern Africa and the western half of Asia. This web site has been established for the purpose of providing detailed predictions, maps, figures and information about this historic event. 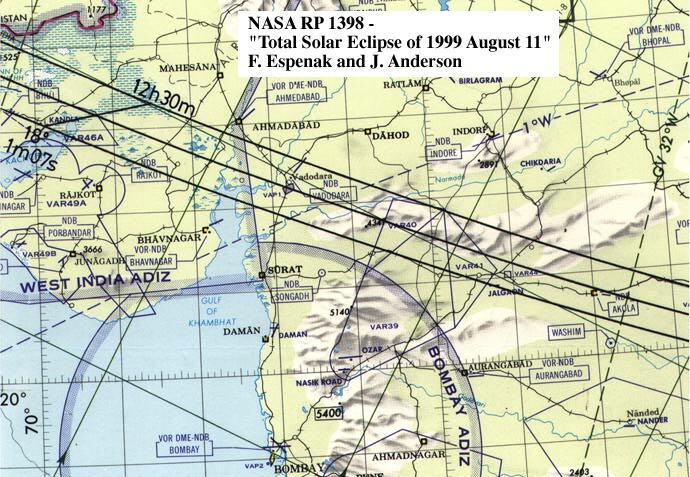 In addition, this site serves as a supplement to NASA RP 1398 "Total Solar Eclipse of 1999 August 11" by providing additional predictions, tables and data for this event. 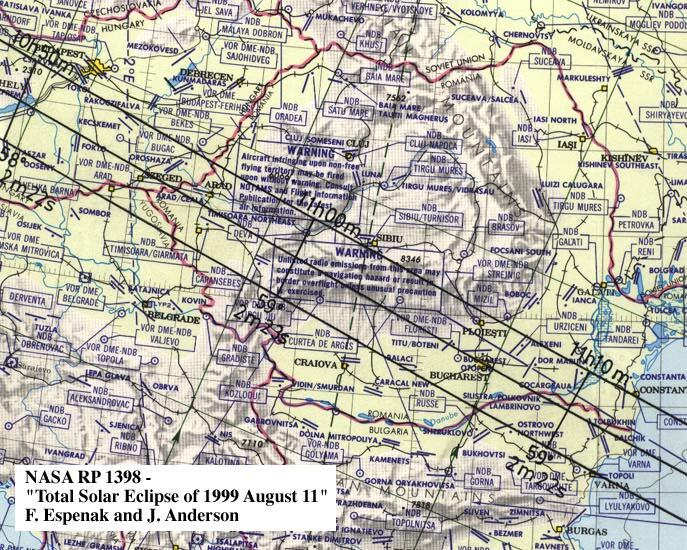 Some of the data posted here include an expanded version of Table 8 (Mapping Coordinates for the Zones of Grazing Eclipse), and local circumstance tables with many more cities as well as for astronomical observatories. 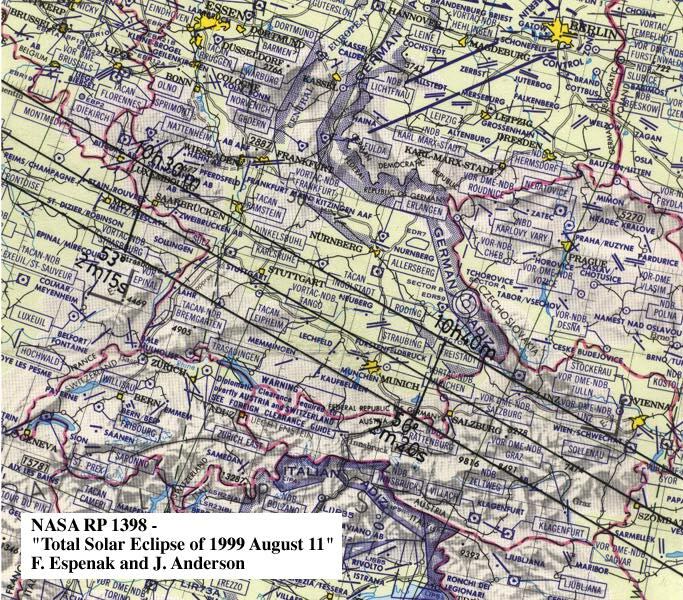 Also featured are higher resolution maps of selected sections of the path of totality and limb profile figures for a range of locatiions/times along the path. 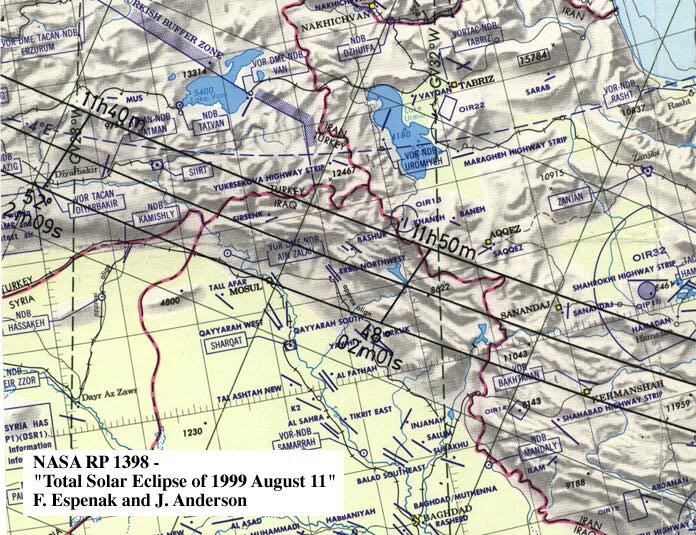 In August, this section will provide links for live web coverage of the eclipse. 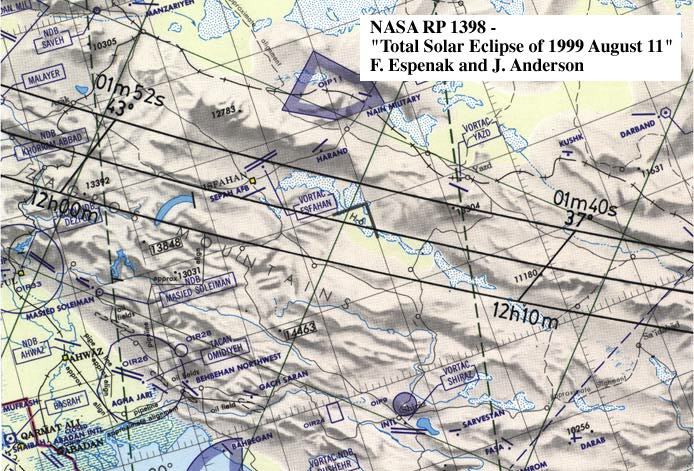 Eclipse99 Live Webcast - NASA/Goddard and Exploratorium. 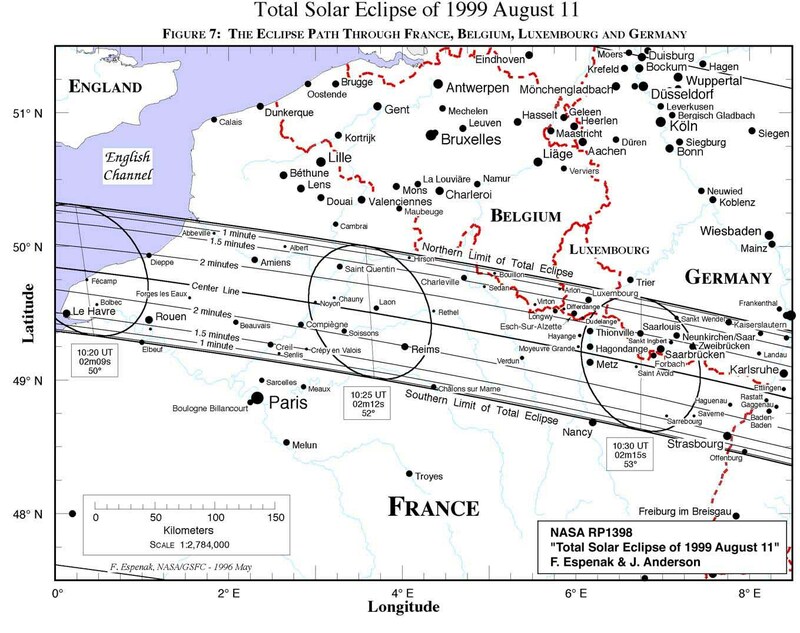 1999 Eclipse Live Webcast - Additional links. 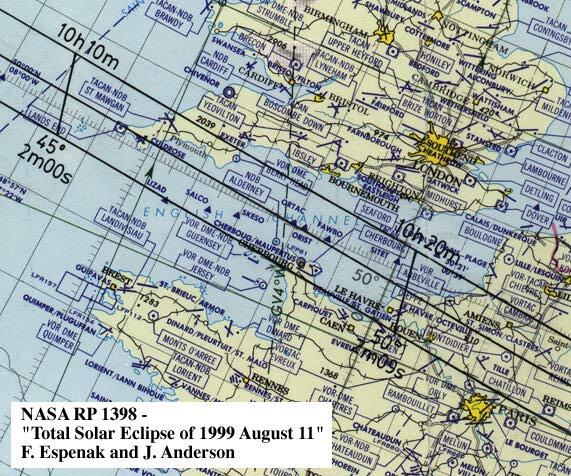 Watch an exciting Computer Animation the 1999 Eclipse Path! What Will The Eclipse Look Like From Your City? The following tables give detailed predictions including the Besselian Elements, shadow contacts with Earth, path of the umbral shadow and topocentric data (with path corrections) along the path. Also included are special extended version tables of path coordinates and graze zones in formats convenient for plotting on maps. 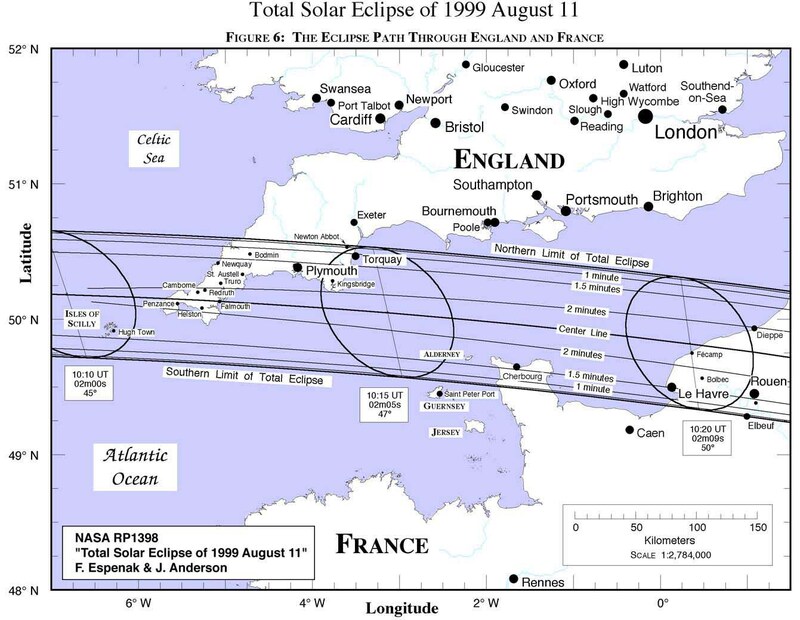 The following maps show the overall regions of visibility of the partial eclipse as well as the path of the total eclipse through three large geographic sections. 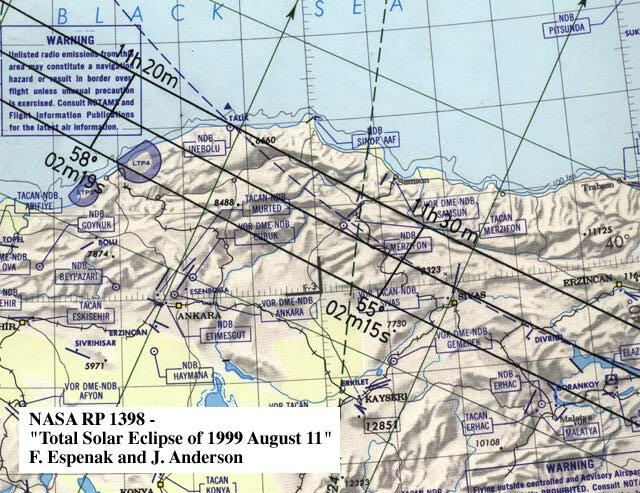 These maps are based on figures from NASA RP 1398 "Total Solar Eclipse of 1999 August 11". 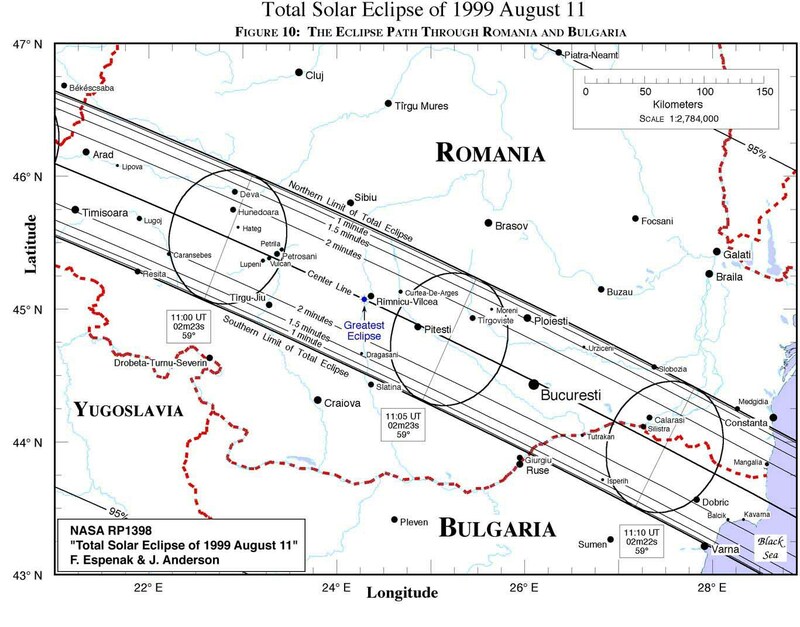 The path of totality has been plotted via custom software onto maps using a simple equidistant cylindrical projection scaled for the central latitude of each map. They all use high resolution coastline data from the World Data Base II (WDB) and World Vector Shoreline (WVS) data. 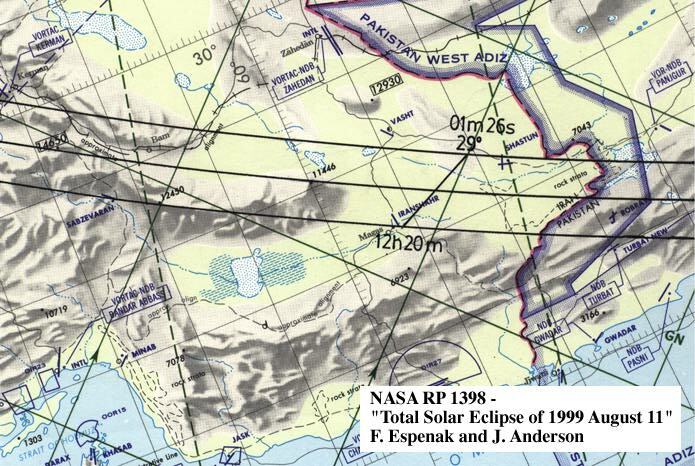 These maps were chosen to isolate small regions along the land portion of the eclipse path. 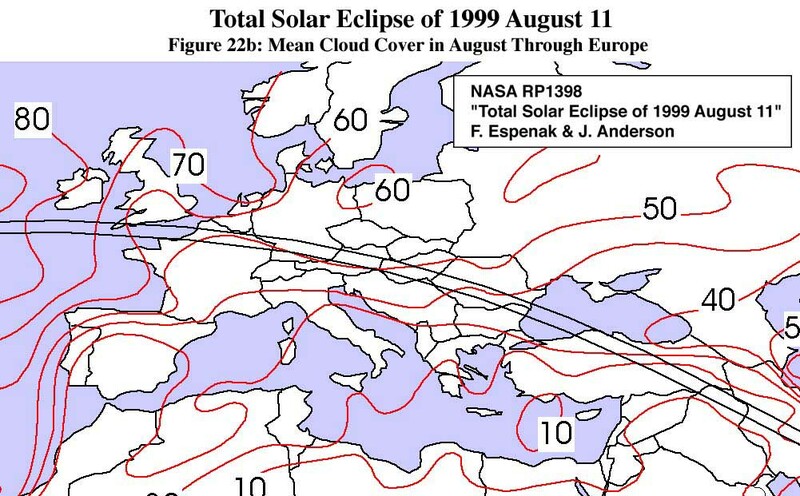 Curves of maximum eclipse and constant eclipse magnitude are included as well as the outline of the umbral shadow. 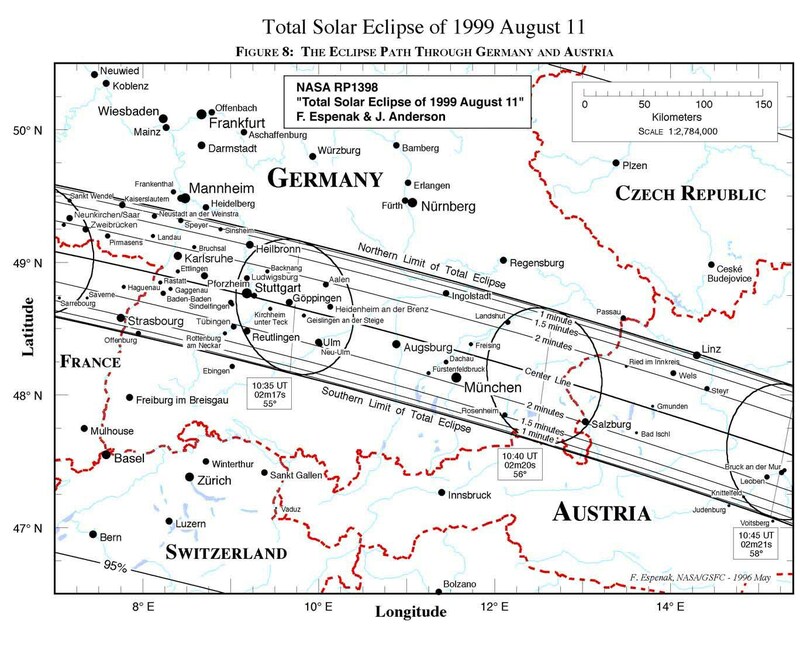 A special feature of these maps are the curves of constant umbral eclipse duration (i.e., totality) which are plotted within the path. These curves permit fast determination of approximate durations without consulting any tables. 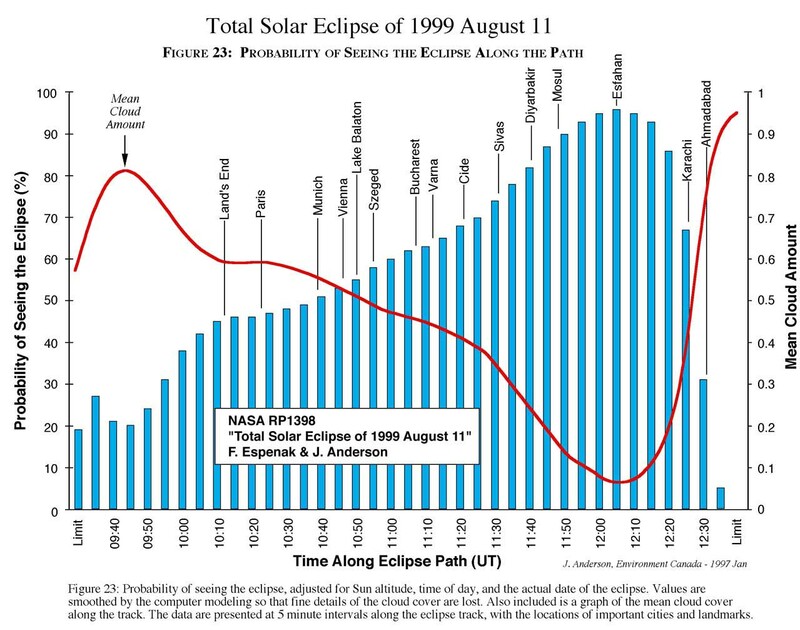 Furthermore, city data from a recently enlarged geographic data base of over 90,000 positions are plotted to give as many locations as possible in the path of totality. Note: Set your printer at 50% reduction to print each of these maps on a single page. 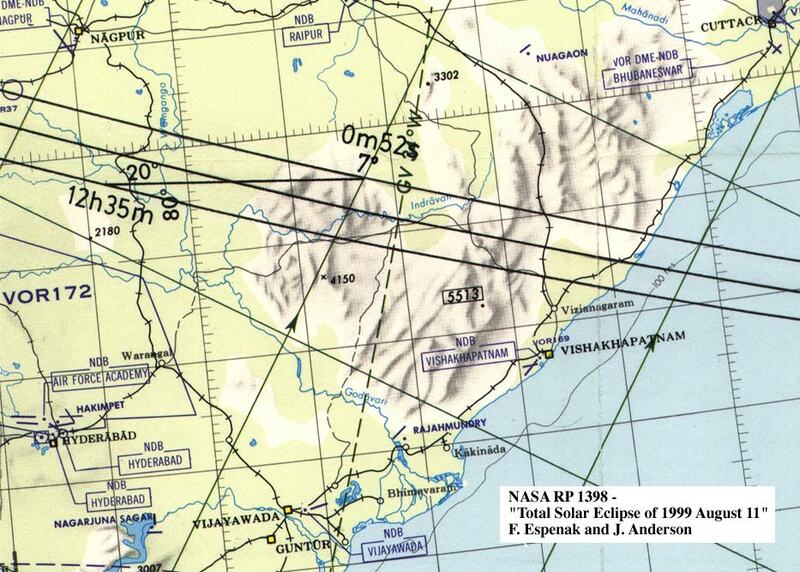 These maps are adapted from NASA RP 1398 "Total Solar Eclipse of 1999 August 11". 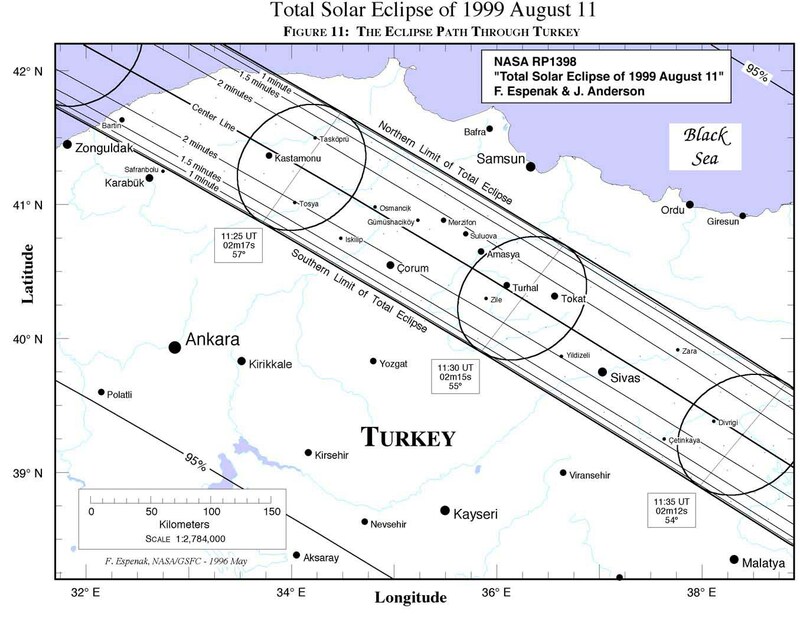 The path of totality has been plotted by hand on a set of ten detailed maps. 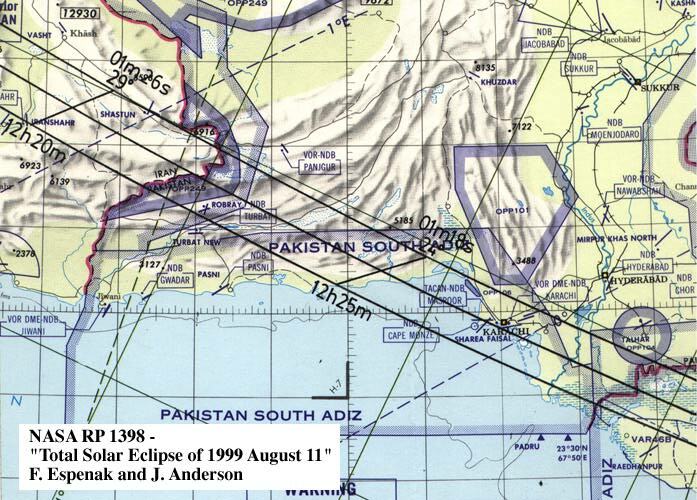 The maps are Global Navigation and Planning Charts or GNC's and have a scale of 1:5,000,000 (1 inch ~ 69 nautical miles), which is adequate for showing major cities, highways, airports, rivers, bodies of water and basic topography required for eclipse expedition planning including site selection, transportation logistics and weather contingency strategies. 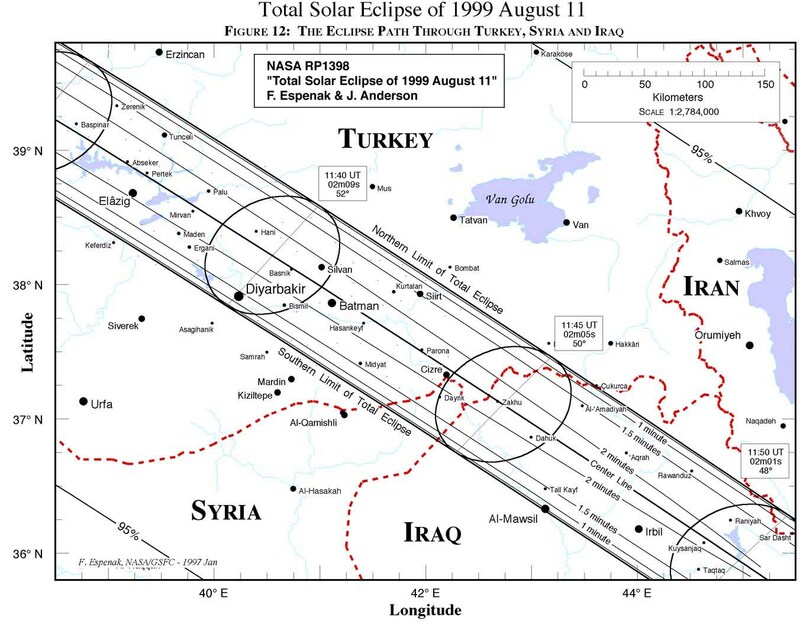 Northern and southern limits as well as the center line of the path are plotted along with the Universal Time, altitude of the Sun and the duration of totality. If observations from the graze zones are planned, then the zones of grazing eclipse must be plotted on higher scale maps using coordinates tabulated elswhere at this site. It's been often said that a picture is worth a thousand words. 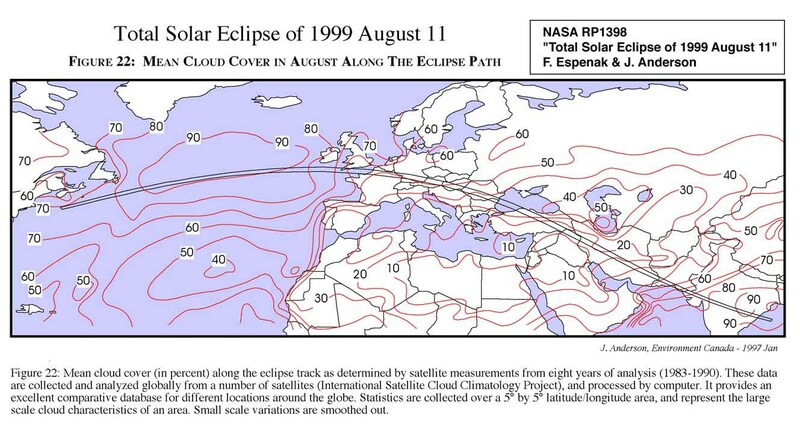 If that's true, then you'll find the following 'pictures' of the 1999 eclipse very helpful. 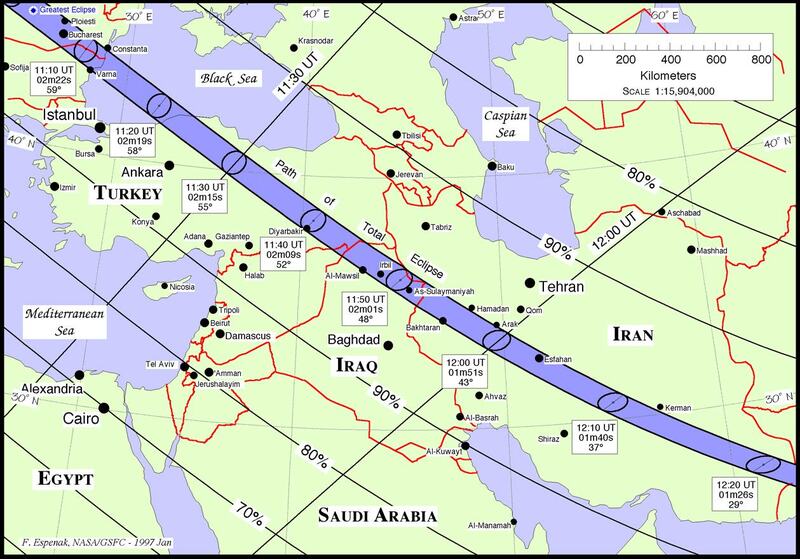 Would you like to see what the eclipse will look like from hundreds of cities around the world? If so, check out the following pages. 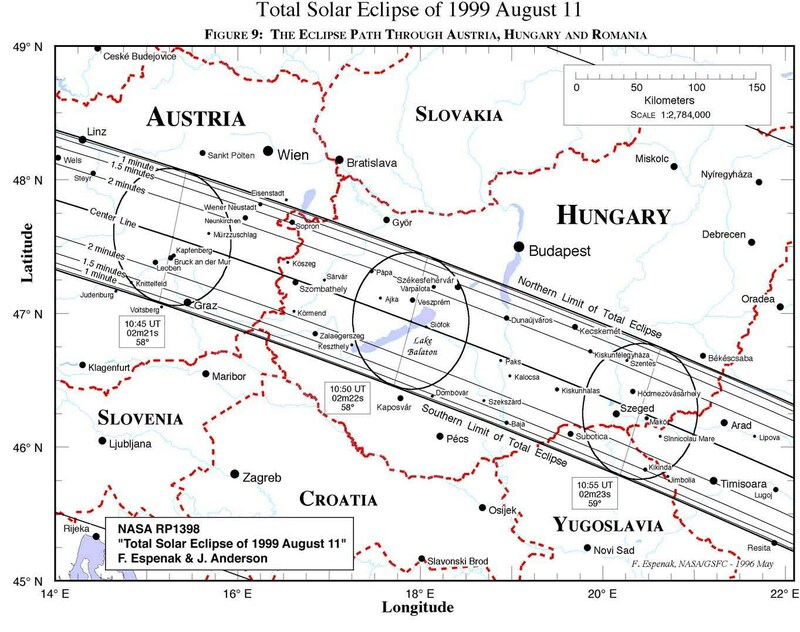 During totality, a number of bright planets and stars will be visible. Venus (m=Ð3.5) will be the most conspicuous planet located 15° east of the Sun. Mercury (m=+0.7) should also be visible 18° west of the Sun. The southwestern sky will be dominated by the bright stars of winter, including Capella (m=+0.08), Albebaran (m=+0.85v), Procyon (+0.38), Betelgeuse(+0.5v), and Sirius (m=-1.46). 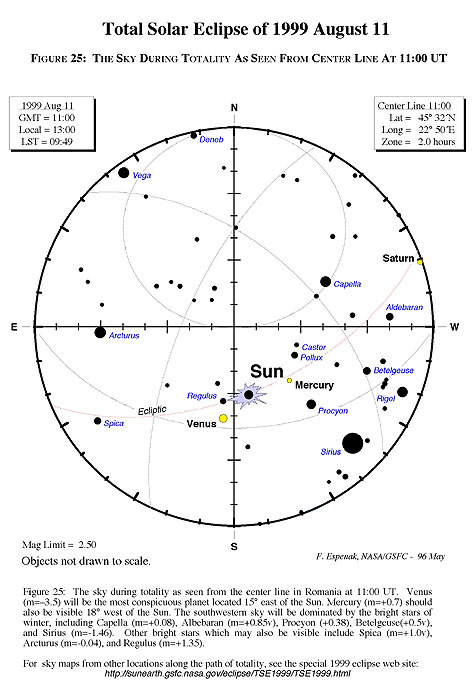 Other bright stars which may also be visible include Spica (m=+1.0v), Arcturus (m=-0.04), and Regulus (m=+1.35).